Crafted by New York's Blue Point Brewing Company and exclusively available at Yankee Stadium. Brewed with Pilsner malt and Motueka hops, with a hint of lime. Available at the Blue Point Bleachers Bar in Section 237. Major League Baseball informed the New York Yankees that putting the faces of players in the foam of beer sold at Yankee Stadium is against league rules, according to a report. The beer foam art of the faces of players such as Giancarlo Stanton, Aaron Judge and Aroldis Chapman were displayed Monday at a media event that also unveiled new concessions for fans to chow down on for the 2018 season. MLB does not permit active players to be involved in the promotion or advertising of alcoholic beverages, Newsday reports. 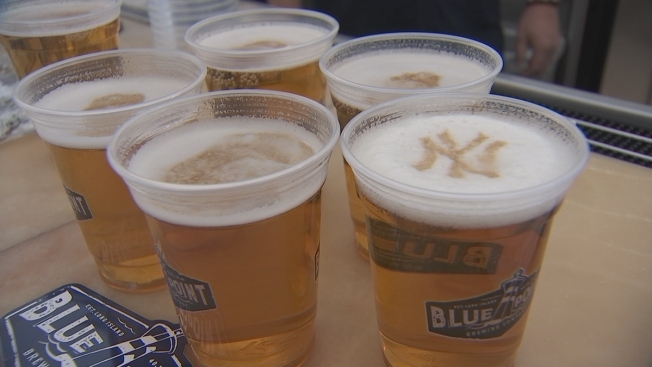 A spokesperson for the Yankees told Newsday that the media event was an opportunity to test the image machine that can decorate the head of a beer. “The Yankees have no current plans of incorporating this decorative element on concessions items this season” the spokesperson told Newsday. Blue Point Beer brews the Pilsner that incorporated the faces of the players, but a spokesperson for the company told Newsday that the images were not the company’s idea. The Yankees home opener is Monday against the Tampa Bay Rays.